Ex-minister of Internal Affairs, General of Police Forces Yury Zakharenko was kidnapped not far from his house in the evening of May 7,1999 . The investigation of his abduction conducted by the state investigating bodies turned out to be useless. As stated by the eye-witnesses of the abduction who were discovered by the public committee formed especially to find the missing general, Yuru Zakharenko had been forced into a car and taken away by a group of people. A number of years before the abduction Yuru Zakharenko had been dismissed from his position as Minister of Internal Affairs. The dismissal of a rather respected among his colleagues officer is believed to be connected with his political attitude towards president Lukashenko and his cabinet people. However the most likely reason of Yuru Zakharenko’s abduction were his activities aimed at creating the Officers Union, an organization out of the government control which was supposed to unite within it high rank representatives of Police and Military Forces. Petrushkevitch and Slutchek, the government investigators in charge of Zakharenko’s case had to seek asylum abroad having discovered a number of facts. Later they made public known some striking evidence proving the existence in Belarus of the so-called “death division”, a force unit created by the government authorities and entitled notwithstanding the legislation to physically suppress the dissenters. 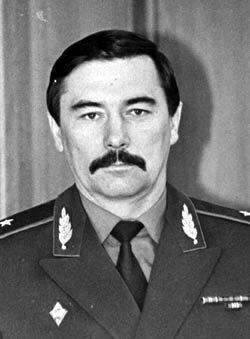 The members of “death division” are considered to be the ones related to Yury Zakharenko’s abduction. Photographs of Yury Zakharenko (2).